Please take a look at the advanced AllStochastics_v4 which uses AllAverages_v3.1. This is MTF version of the well-known indicator with the ability to build double Stochastic if DoubleMode = 1. Stochastics gives its strongest sell signal when the two moving averages that comprise it have first been above 80 and then close below the 80 level. The strongest buying signal is given when the two moving averages have first been below 20 and then close above 20. Ideally, we should use Stochastics, and any other indicator for that matter, only to take trades in the direction of the Daliy trend. So if a trader determines that a pair is in an uptrend, they would then consult Stochastics to time their entry after Stochastics has been below 20 and then closed above the 20 level. In a downtrend, such as we have on the Daily chart of the USDCHF below, they would look for Stochastics to have been above 80 and then close below it for the signal to sell the pair. For Stochastics to close below 80 in a downtrend or above 20 in an uptrend is a much stronger signal than if Stochastics simply goes above or below those levels during the course of the time that the candle is open. For example, let's say that a trader is using a 1 hour chart. When that 1 hour candle closes at the end of the hour, the trader can check Stochastics to see if the two moving averages were above 20 or below 80 after the close occurred. That will confirm that the indicator did indeed close above or below the requisite level. Before we enter into any trade, we need to find market direction by trend identification. Below we have the EURGBP on a 4Hour Chart. We can see the pair is making new highs while establishing higher lows. This is the first sign that the EURGBP is trading in a strong uptrend. This analysis can be confirmed by the use of a 200 SMA. 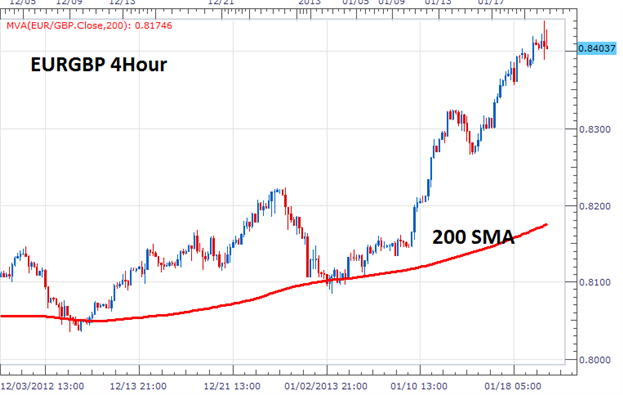 Traditionally traders are bullish when price is above the 200 SMA and bearish if price resides under the indicator. Given the information above traders should look to buy the EURGBP. If the trend continues, prices are expected to make higher highs. Once market direction is identified, we can then use an indicator to enter into the market. Below we can see the Stochastics (SSD) Oscillator on a 1Hour chart. Since we are only looking to buy in an uptrend, it is important to identify areas where the market is oversold. 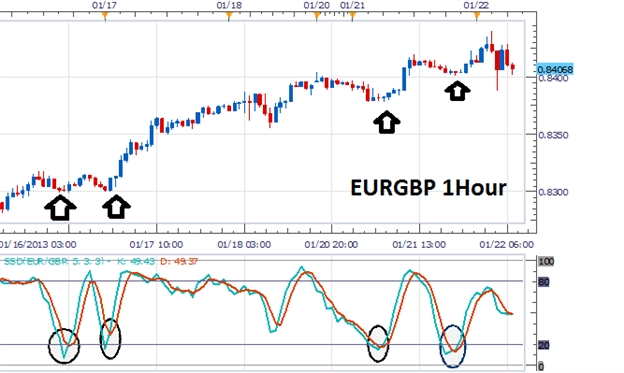 The Stochastics indicator marks this with the 20 level running horizontally along the indicator. Traders looking to buy a retracement can then enter the market when then %K value crosses above the %D value signaling a return to bullish momentum. 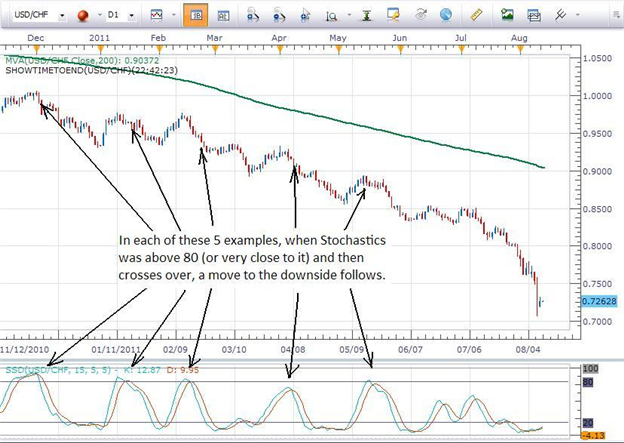 Below you will find several sample entries using Stochastics. The arrows below price have been included on the chart to better understand where execution may occur. Now that a trade has been opened, traders need to have a plan to exit the market. This is the final step in developing a successful strategy! Traders may choose a variety of stop / limit and risk reward combinations here to suit their trading needs. 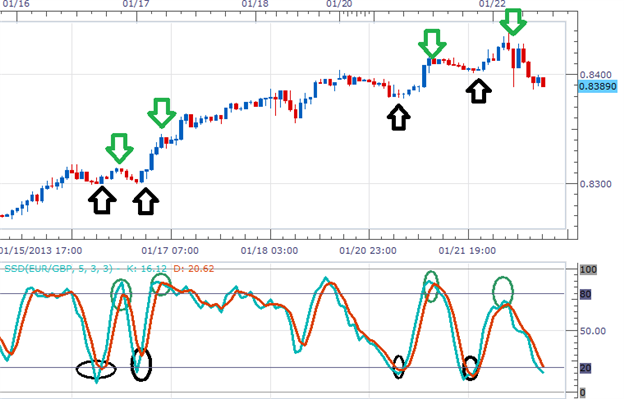 However, if you are already using the Stochastics Oscillator for entries, you can also use it to plan your market exit. If we are buying on a return to bullish momentum, traders should conclude buying when momentum subsides. This can be found when %K crosses back below %D. The green arrows below have identified where our sample trades would be closed using this technique. Regardless of the methodology chosen, it is always important to have a plan to exit the market. Once you have this final component in place, you then proceed to test your strategy live in the Forex market. Developed by George C. Lane in the late 1950s, the Stochastic Oscillator is a momentum indicator that shows the location of the current close relative to the high/low range over a certain number of periods. New traders typically want to know the difference between Fast Stochastics and Slow Stochastics. They also want to know whether the typical default settings of 5,5 (Fast Stochastics) or 5,5,5 (Slow Stochastics) as seen in most charting packages developed for FX are better or worse than the typical default settings of 14,3 (Fast Stochastics) or 14,3,3 (Slow Stochastics) seen in stock and futures charting packages. First of all, the difference between Fast Stochastics and Slow Stochastics is just a moving average. When calculating Fast Stochastics using the values of 5 and 5, the first “5” is the raw value for Stochastics, while the second “5” is a 5-period moving average of the first “5”. When using Slow Stochastics, the first two 5’s are the same as with the Fast Stochastics, with the third “5” being a moving average of the second “5”. Yes, that’s right, a moving average of the moving average. This slows the movement of the indicator down even further, hence the name of Slow Stochastics. By slowing the movement of the indicator down, we will see fewer signals to buy or sell on the chart, but they should be more reliable signals. By using a larger value in calculating the raw value of Stochastics, we slow the indicator down even more. 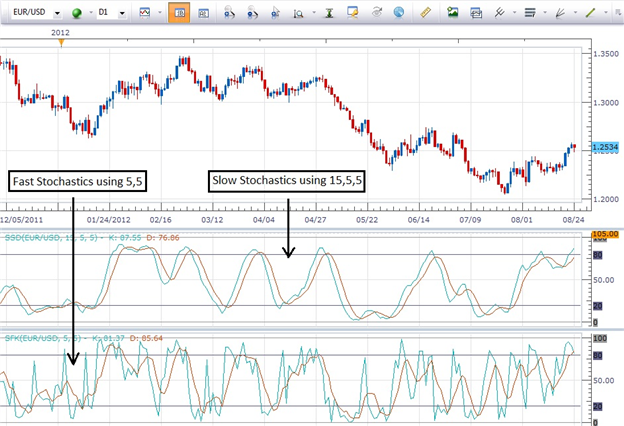 This is why I recommend to traders using FX charts to use the Slow Stochastics with values of 15,5,5. This combination offers fairly reliable signals that can offer solid entries into trading opportunities. The chart below shows the difference between Fast Stochastics with values of 5,5 compared to Slow Stochastics with values of 15,5,5. You can see how much easier it is to identify the signals using the Slow Stochastics. Being able to use the technical tool effectively is most of the battle. By keeping things simple and consistent, we should start to see consistent results in our trading. As with all indicators, entering a trade only when the indicator generates an entry that is in the direction of the trend can result in a higher probability of success. Let me start by saying that there are 3 different types of stochastic oscillators: the fast, slow, and full stochastic. All of them operate in a similar manner however when most traders refer to trading using the stochastic indicator they are referring to the slow stochastic which is going to be the focus of this lesson. The basic premise of the stochastic is that prices tend to close in the upper end of their trading range when the financial instrument you are analyzing is in an uptrend and in the lower end of their trading range when the financial instrument that you are analyzing is in a downtrend. When prices close in the upper end of their range in an uptrend this is a sign that the momentum of the trend is strong and vice versa for a downtrend. The Stochastic Oscillator contains two lines which are plotted below the price chart and are known as the %K and %D lines. Like the RSI, the Stochastic is a banded oscillator so the %K and %D lines fluctuate between zero and 100, and has lines plotted at 20 and 80 which represent the high and low ends of the range. Whatever charting package you use will calculate the lines for you automatically but you should know that the data points which form the %K line are basically a representation of where the market has closed for each period in relation to the trading range for the 14 periods used in the indicator. In simple terms it is a measure of momentum in the market. The %D line is very simply a 5 period simple moving average of the %K line. Lastly you should know that you can change the inputs for the indicator and use for example a 3 period moving average of the %K line to get faster signals, however as this is an introduction to the indicator and because most traders I know do not change the standard inputs, I do not recommend changing them at this point. Like the RSI the first way that traders use the stochastic oscillator is to identify overbought and oversold levels in the market. When the lines that make up the indicator are above 80 this represents a market that is potentially overbought and when they are below 20 this represents a market that is potentially oversold. The developer of the indicator George Lane recommended waiting for the %K line to trade back below or above the 80 or 20 line as this gives a better signal that the momentum in the market is reversing. The second way that traders use this indicator to generate signals is by watching for a crossover of the %K line and the %D line. When the faster %K line crosses the slower %D line this is a sign that the market may be heading up and when the %K line crosses below the %D line this is a sign that the market may be heading down. As with the RSI however this strategy results in many false signals so most traders will use this strategy only in conjunction with others for confirmation. The third way that traders will use this indicator is to watch for divergences where the Stochastic trends in the opposite direction of price. As with the RSI this is an indication that the momentum in the market is waning and a reversal may be in the making. For further confirmation many traders will wait for the cross below the 80 or above the 20 line before entering a trade on divergence. 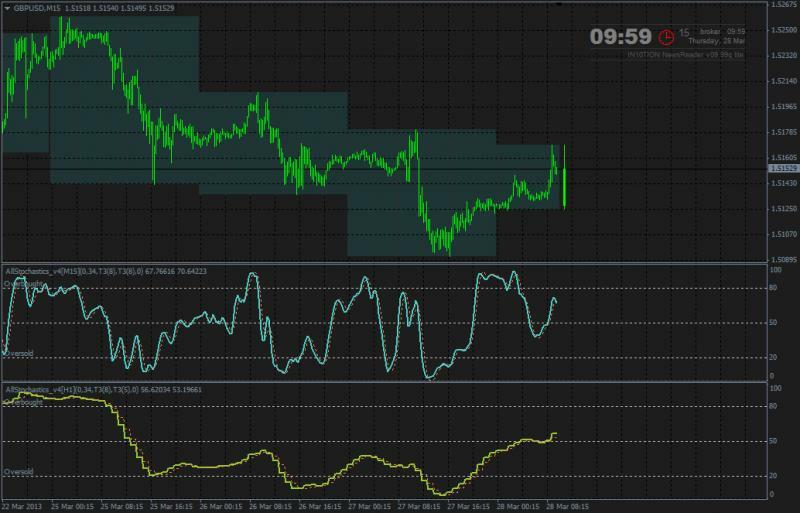 Thanks Igor for AllStochastics_v4 indicator. REQUEST EDIT: No need it more! Last edited by secretcode; 07-20-2013 at 03:31 PM. Is it possible to convert this indicator for 'Chart Window' on 'Bollinger Band' as shown in Image ? Also we can adjust Bollinger period (stoch 50 level) and deviation (stoch 80 & 20 level) through inputs !!! I believe this is 'Public forum' !!! Forum is public but there is some ethics : if you are uploading something from the other forum so provide the links where the indicator was taken. But ... as I know - they (tsd) will delete our links (on the same way as they deleted my posts which I made few days ago). So called 'friendly forums' are not deleting our links (in most of the cases), and we do/will place their links to our forum too, and this is very friendly situation. Non-friendly forums are just collecting external content to their forums without any links where it was taken from. So, this is some explanation.